Warm weather is all about spending afternoons playing outdoors. Unfortunately, many studies show that today’s kids simply do not get enough outdoor playtime. Thanks to new toys from JAKKS Pacific, parents can encourage children to embrace the outdoors this summer and enjoy classic toys and activities but with a modern twist to appeal to today’s kids. My son is a HUGE fan of Thomas the Tank and also of playing outside and at the park! So when he saw the Thomas the Tank Toddler Swing we received from JAKKS Pacific, he was so excited! He immediately climbed in it to make sure it was a good fit and it was! 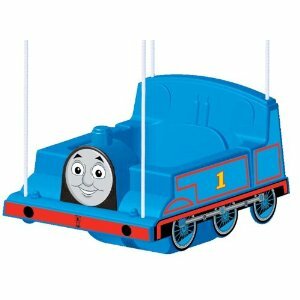 Your children will LOVE swinging along with Thomas the Tank on the Thomas the Tank Toddler Swing! It features cool details and art inspired by Thomas the Tank and is made to be very sturdy, comfortable and safe with its high back supports, adjustable safety seatbelts and colorful sculpted details. There is no assembly required so we could immediately put it up on a branch or sturdy frame and get swinging! This unique toddler swing includes the hanging hardware and heavy duty ropes for safe swinging! If you are looking to get your children outside this summer, get them these super fun toys from JAKKS Pacific and then they will be BEGGING to get outside and play with them! Buy It: You can purchase the Thomas the Tank Toddler Swing for a SRP of $29.99 and is available at Toys R Us.